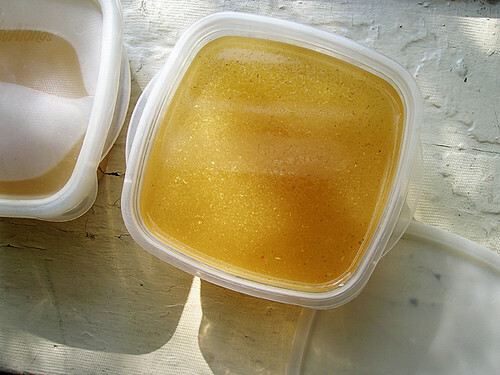 So if you've been making chicken jars and saving rotisserie chicken carcasses all summer, and actually this will continue with baked chicken thigh bones all fall, you've been amassing ziploc bags of chicken parts in the freezer, so every once in a while you make a batch of stock to keep things under control. Sometimes I make soup straightaway with the stock, and sometimes I freeze the stock in containers; it's nice to have one or two frozen stocks on hand for when one of us gets sick. I try to make a chicken stock when I've filled a gallon ziploc bag of parts, not only to keep the freezer under control but also because it's a manageable amount of stock. I'm aiming to make two quarts of finished stock, so I start with three quarts of water (which I measure with a quart mason jar, by the way). Also by the way, the apple cider vinegar is to dissolve more minerals out of the chicken bones, which is one of the benefits of consuming homemade chicken broth. Below are the standard vegetables I use for stock and generally always have on hand, but really you can throw anything in—once I did fennel instead of celery stalks, that was really delicious. Put chicken parts, water, and apple cider vinegar in a stock pot over high heat, bring to a strong simmer, then reduce heat to low and simmer for 2-3 hours. Roughly chop onion, celery, and carrots, add to the stock pot, and simmer for another hour. Ladle out as much chicken and vegetable as you can, then pour the broth through a cheesecloth-lined strainer into another pot. Let cool a bit and pour into containers. Okay, now what? So actually I wouldn't use this stock for a classic chicken soup with, like, chicken and vegetables and maybe noodles; I'd do a quick chicken broth with the chicken that's going to end up in the soup for that, I'll write that up in a minute. The very easiest thing to do with this is to dice up the contents of a chicken jar or some baked chicken and roasted vegetables and toss it into the stock, or just toss whatever ground meat, greens, and rice or quinoa you have into the stock, heat it all up, et voila. Or if you have a bag of frozen vegetables on hand, you could try the oldest recipe in my book, good old creamed vegetable soup.